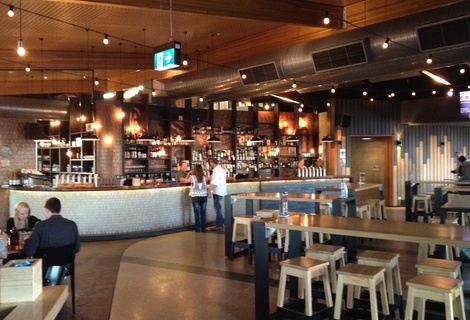 Modern Suburban Pub - Good range of beers and food. The Quarie was reviewed on Saturday 6th October 2012 18:36 by Richard. It might just be me, but over the last couple of years I've noticed a growing trend across Perth of suburban pubs being transformed from dark, dingy old watering holes to swanky, modern and often family friendly modern venues. Crusty couches are being swapped out for modern leather lounge suites, Swan Draught, VB and Tooheys Old taps are being traded for James Squire and little creatures and on the whole staff seem to be a lot more helpful and genuinely friendly. 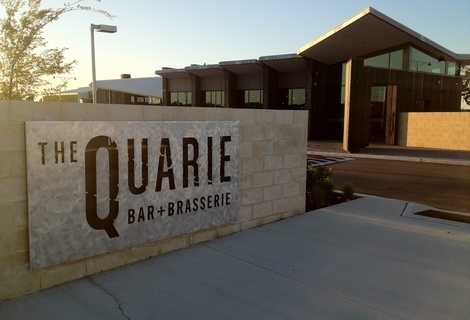 Although The Quarie in Hammond Park is brand new, not renovated from an older establishment, it's a prime example of the new standard for Perth's suburban pub. We stopped in for an early dinner on our way down to Rockingham. We were greeted by friendly staff as we walked in and shown to a table in the dining area of the pub. Both the interior and exterior of the pub look great, the use of timber, steel and glass gives it a great rustic feel and the space inside has been used really well, plenty of standing and seated areas as well as a big beer garden style outdoor area out the front. Full table service was provided in the dining area by our waiter who was both friendly and helpful, suggesting I try their own "Quarie Ale", brewed by students at ECU's award winning Degrees Brewery. Boy am I glad he suggested it, not only because it was the cheapest pint ($9) at the bar, but it was delicious, one of the better beers I've had this year. There's a decent range of food and drinks on their menu, especially beer, with over 20 beers on tap and an additional 30 or so in the bottle. We ordered a few Quarie Ales as well as a steak and a warm Thai beef salad. Our food came out within 20 minutes of ordering, which is pretty impressive for a busy Saturday night, it was obvious some care had been taken in plating it up a pleasant change from pub food just being slapped onto a plate and being served "as it lies". 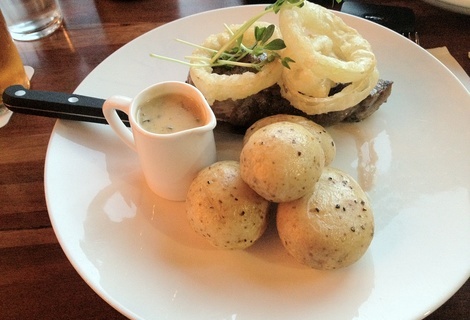 Over all the steak was as decent as pub steaks go, my only compliant would be the overload of 'baby' baked potatoes, they were more like adolescent potatoes than baby potatoes, I couldn't get close to finishing them. 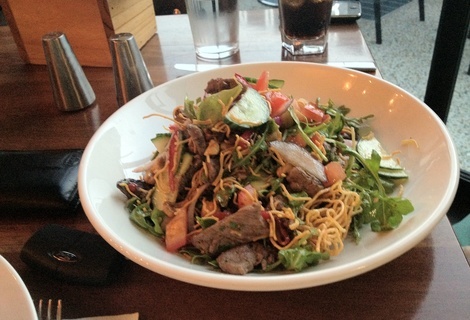 The Thai beef salad was easily the winner of the two, plenty of fresh ingredients (including loads of coriander), a simple dressing and the addition of crispy noodles gave the dish an authentic asian flavour with a nice crunchy texture. The Quarie has set the bar quite high for suburban pubs, with reasonable prices, friendly service, modern decor and a good range of quality food and drinks. I think we are now going to make this a mandatory stop off on any future southbound trips.